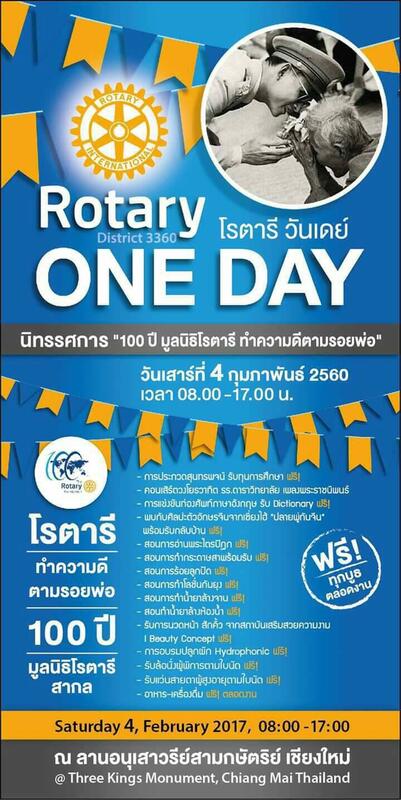 On the auspicious occasion of the 112th Anniversary of Rotary and 100th Anniversary of Rotary Foundation, the Rotary International District 3360 under supervision of by District Governor อนุศิษฐ์ ภูวเศรษฐ organized the Rotary One Day Event on Saturday, February 4, 2017, from 8:00am – 5:00pm at the Three Kings’ Monument. 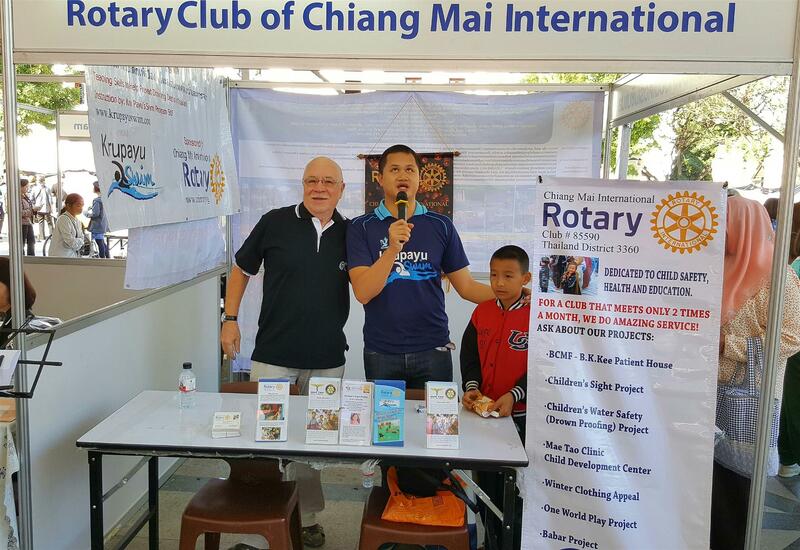 This event was hosted by Chiang Mai Rotary Club in collaboration with 19 Rotary Clubs in Chiang Mai province. 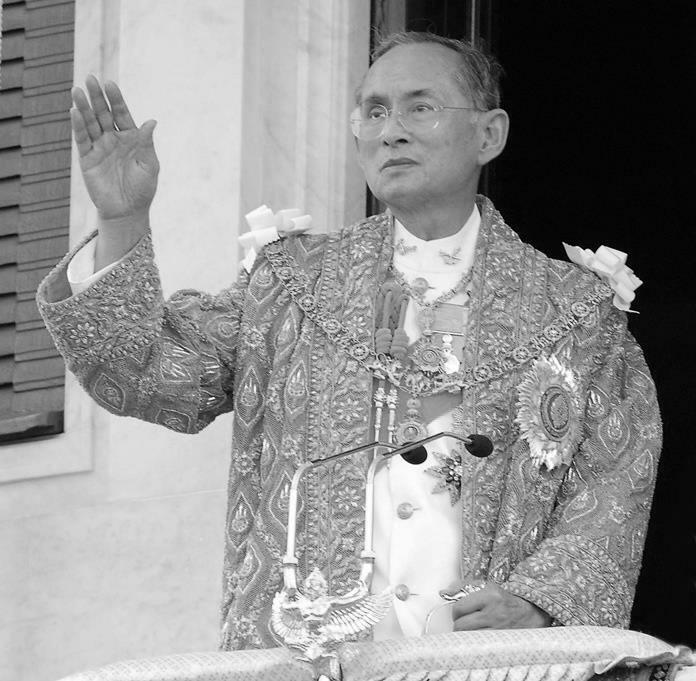 Meanwhile during the mourning period and in remembrance of His Majesty the Late King Bhumibhol Adulyadej, the slogan of the event is “100 Years of Rotary Foundation: Do Good Following King Rama IX’s Footsteps”. A number of exhibitions on community service activities were displayed under the theme of HM the Late King’s projects. 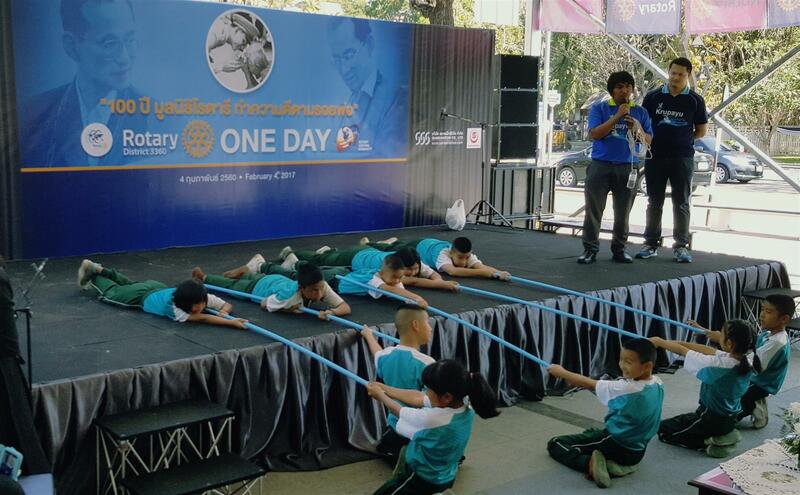 The activities offered to the public at the Rotary One Day event included community services exhibition, vocational courses, free food and water for visitors, and stage performances; i.e. the ceremony of exchanging old noodle pot with led-free noodle pot for local noodle shop owners; dance show raising awareness of and promoting prevention from dengue fever; speech contest on “100 Years of Rotary Foundation: Do Good Following King Rama IX’s Footsteps”; Tripitaka reading challenge; story-telling for young children under the “Love Rotary Love Reading Project”; demonstration on how to survive drowning in children; and musical performance of HM King Rama IX’s songs by the marching band of Dara Academy. Students from CMIRC's Childrens Water Safety & Drown Proofing Program demonstrate helping others out of the water. A number of 500 visitors approximately plus 482 Rotarians contributed to the success of this Rotary One Day event. The goals of the event were fully accomplished with the exhibitors, visitors, collaborations with other entities. This certainly ensures the successful determination and positive image of Rotary Clubs in Chiang Mai as a whole.